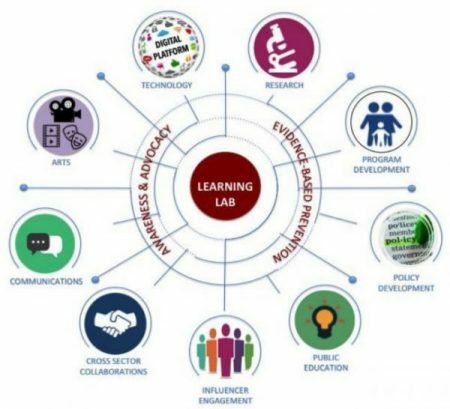 The objective of the Learning Lab is to create a synergistic continuum that brings together prevention models, public awareness and advocacy and unite the public and private sectors to impact change. Critical to our strategy is to shift the conversation from intervention to prevention. Our approach builds and expands over time and creates a sustained movement to promote intimate partner health. With our proactive, rather than the traditional reactive approach to this public health crisis, we uniquely leverage the expertise of the Harvard T.H. Chan School of Public Health with the storytelling and advocacy prowess of Saving Promise to galvanize the strengths of our multi-sector collaborative partners.